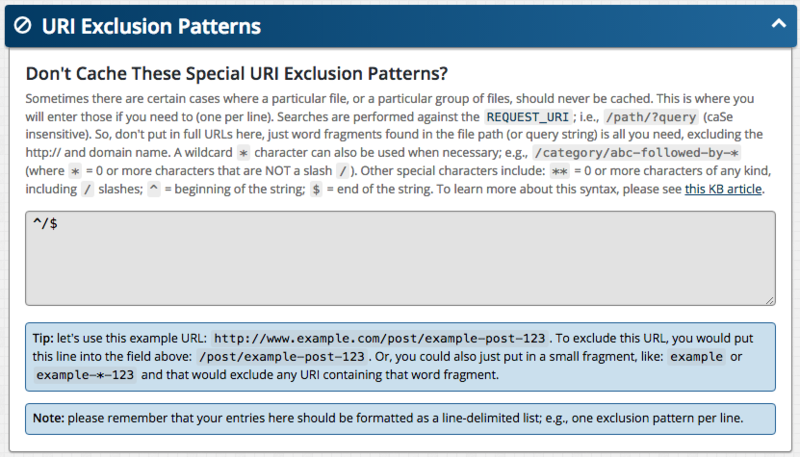 The URI Exclusion Patterns feature (see Comet Cache → Plugin Options → URI Exclusion Patterns) can be used to exclude specific pages on your site from being cached, including the Home Page. Using the powerful Watered-Down Regular Expression Syntax, it is possible to define an exclusion pattern that will match the beginning of a URI and the end of a URI. In the URI Exclusion Patterns panel (see WordPress Dashboard → Comet Cache → Plugin Options → URI Exclusion Patterns), we'll enter a pattern that will tell Comet Cache to exclude the home page from being cached. This pattern says to match any URI that starts and ends with a slash, which means that it's the home page. The Watered-down Regular Expression syntax is supported in several existing Comet Cache features and makes it possible to fine-tune the Comet Cache configuration to suit your needs. For more information on the Watered-Down Regular Expression Syntax, see this KB Article.